Day after day, the same commute, the same ride, the same potholes to dodge, the same creative maneuvers through badly planned infrastructure, the only things changing are the wind direction & temperature. The mild winter should have left me more opportunities to explore and play on my bike between home and work, but thanks to a perfect storm of illness, appetite killing medications (which I’m thankfully off now), and quitting my pop habit (which is a really good thing, but I’ve missed those extra 500 calories a day), my body has been left short on fuel and exhausted, and I’ve lost weight (and I did not need to lose weight). In fact, for the first time in my life, my BMI is in the “underweight” category (my doctor told me that I shouldn’t expect any sympathy for this problem). This has also meant that my commute has become extremely rote, always the same, shortest route, treading closer to feebleness than enjoyment. Sunset, brighter in the puddle world, as the first fingers of ice crystals begin to envelope the water. For a short time in spring, the puddles of melting snow offer a glimpse into a different world, similar to this one, but the sun is brighter, the sky is clearer, there’s magic in the air and the outlook is always up. Only in a reflection can you see the magic in the air. 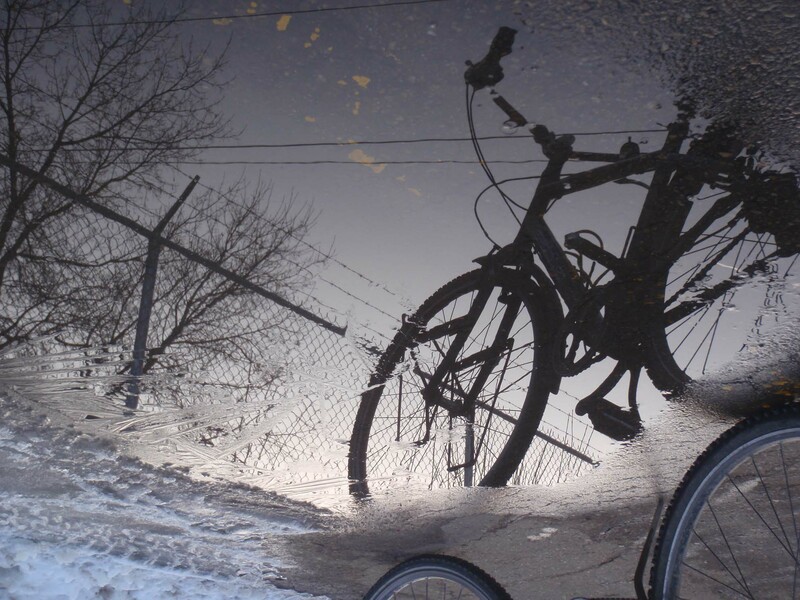 And so my commute came to life again, and staring into the puddles & watching the constantly re-framed reflections allowed me to see my familiar surroundings from a different perspective. Sometimes, a different point of view makes all the difference in getting out of rut. I could look back at this past winter as a lost opportunity for all sorts of winter adventures. 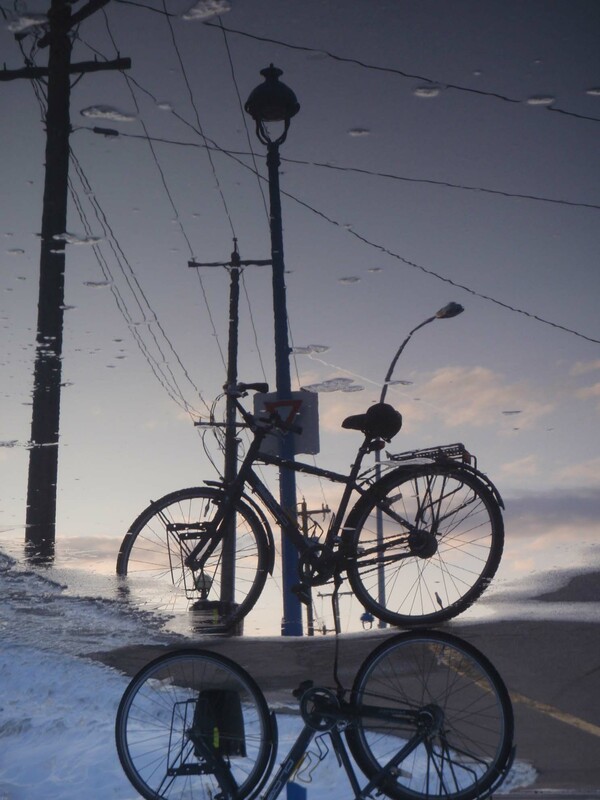 For Edmonton, it was a cyclist’s dream, the mildest winter in memory, warmer and for more days than this born & raised prairie girl would dare to hope for. Yet, I probably would have done the same cycling if it was constantly -20. 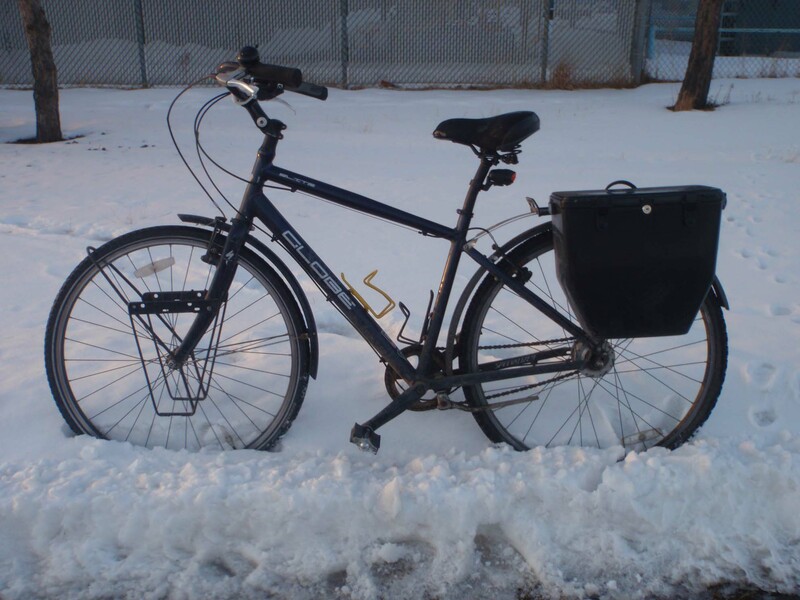 Let it be known, that for a few short days in March, there was just barely enough snow on the ground for a "Canadian kickstand." But it isn’t just weather that makes the winter, and instead of looking back I’m focusing on the future with a reacquired sparkle in my eye, and full fat coconut milk on my cereal. It’s a beautiful day out there today, and instead of watching this hilarious video over and over again, I really should go outside and get on a motherfucking bike. (And I have never done anything pictured in this video, not at all, not even once, especially not 2:03, though I’ve fantasized about 1:44).